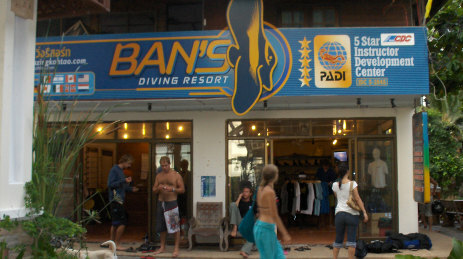 Ban's diving resort Ban's is one of the larger (if not the largest) diving resorts on Koh Tao—last year they licensed 5,000 open water divers! They have instructors covering most of the European languages (with of course Thai too) and books covering the course material in a very wide range of languages (they even had Norwegian and slightly less surprisingly Thai). They do endeavour to teach in your preferred language, but in mixed nationality classes you're still likely to get a lot of English. It doesn't make nearly as much difference as you might think though. Once you're underwater nobody's doing any talking anyway and the sign language that you learn works no matter what you actually speak. Most of the technical knowledge you're going to get from the book, and the practical things you'll be doing so often that by the time you have your license you'll be good enough not to be total danger to yourself.